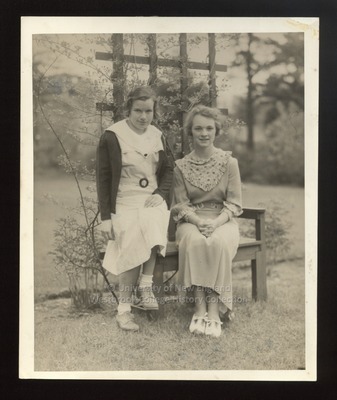 "Phyllis Sanders and Bertha Borden, Westbrook Junior College, Class of "
Two Westbrook Junior College students from the Class of 1935, Phyllis Sanders and Bertha Borden, pose on a trellis bench outside on the campus. They each wear belted spring/summer dresses with large collars and tie shoes. One girl sits on the arm of the bench, the other sits on the bench seat. Both have shy smiles and look directly at the camera.